MONAGHAN’S LAST LEAGUE or championship defeat to Cavan may have come six years ago, but All-Star forward Conor McManus insists that there will be little to separate the Ulster neighbours at Clones on Saturday. Both teams sit in the Division One relegation zone ahead of the penultimate round of matches, having claimed just one win apiece from their five outings. The Farneymen recorded their sole triumph against All-Ireland champions Dublin on the opening day before suffering a dip in form to lose four in a row, leaving McManus to predict that this weekend’s showdown will be decisive for the loser. “There’s no doubt that both teams are coming to Clones on Saturday knowing the state of play and what’s at stake,” McManus told the42. “Whoever loses, basically, is relegated; whoever wins has a fighting chance of staying up. Both teams are well aware of that and I’m sure it’ll add to the game and the occasion. The Clontibret man is at a loss to reason his team’s slump in form considering the hype that surrounded their defeat of the Dubs. Plenty had installed Malachy O’Rourke’s side firmly in the All-Ireland reckoning in the aftermath. Narrow subsequent reverses to Galway, Roscommon and, most recently, Kerry has seen their credentials take a bashing, though, even if, McManus admits, there were positives in the Killarney loss of a fortnight ago. “It’s hard to put your finger on it [dip in form]. The reality of it is that when you’re in Division One and not performing to your best, you will get it hard and that’s just where we’re at. “Last year we won a couple of games by a point and things were looking great and people talking about how well we were going. Fast forward a year and we’ve lost a couple of those games by a point or two and you’re being told how poor you’re going. “There is a very fine line, but it’s important not to get too caught up on it either way. We just need to focus on getting the performances because it’s all you can control. “We showed some resemblance of where we can get to [against Kerry]. We know there are still improvements to be made from the Kerry game. We only played for 45 or 50 minutes and didn’t finish it out, but it was considerably better than what we had put in in the previous couple of weeks. The Clones factor, he hopes, will sway the derby his team’s way. That would give them an opportunity to salvage their top-flight status away to Mayo on Sunday week. 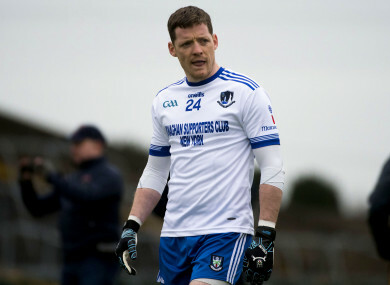 Email “'Whoever loses, basically, is relegated' - Monaghan star on pressure of Saturday's clash”. Feedback on “'Whoever loses, basically, is relegated' - Monaghan star on pressure of Saturday's clash”.